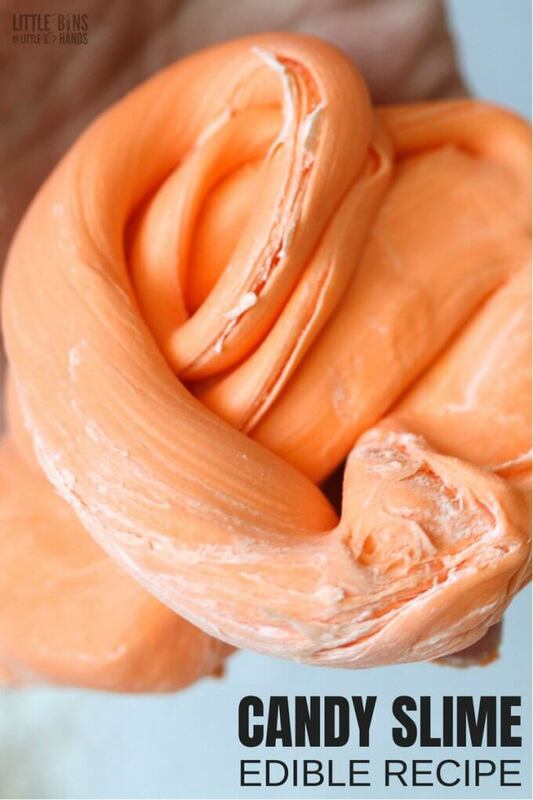 Our newest taffy slime recipe is a huge hit. Because as we all know, taffy candy is super stretchy and kids love stretchy slime! Edible slimes are super popular right now, and we will show you how to make edible candy slime using taffy! 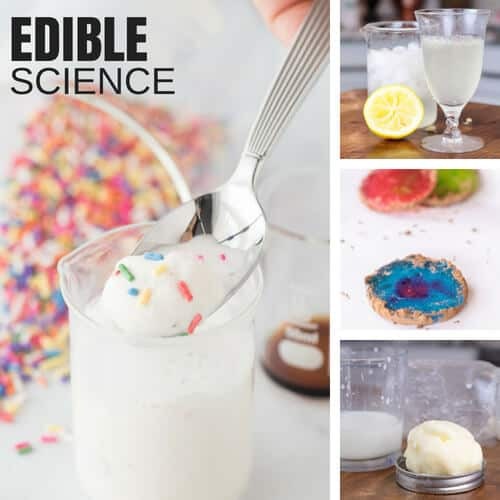 Explore a tasty, borax free sensory treat with our easy to make edible slime ideas for kids. Kids love our edible slimes as much as they love our traditional slime recipes now! Why is that? I am pretty sure it’s because edible slimes are SWEET! Your dentist won’t be approving any of our edible candy slime recipes anytime soon but I can guarantee you that these are definitely kid approved. You can easily learn how to make edible slime with candy including marshmallows and gummy bears too! Check out our gummy bear slime video below. Making taffy slime is a similar process. HOW DO YOU MAKE EDIBLE TAFFY SLIME? We’ll show you how to make taffy slime with taffy candy, powdered sugar, and a little cooking oil for an edible slime treat. 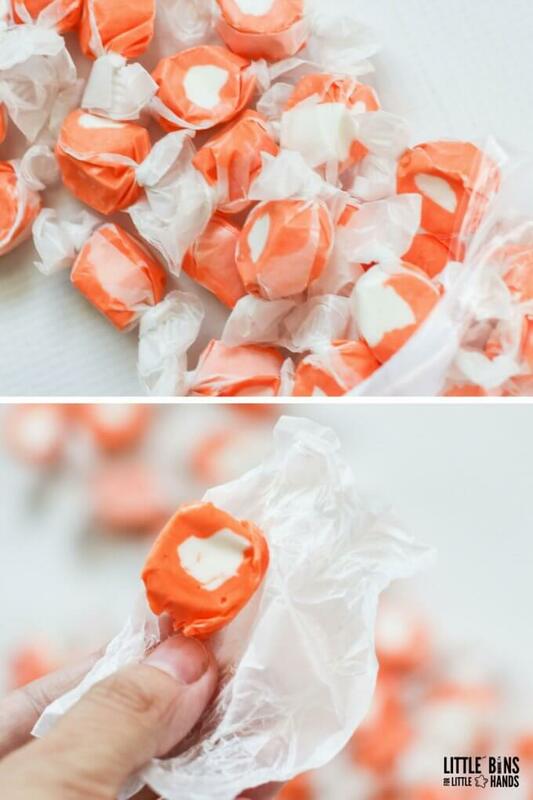 You can easily snag cheap bags of candy in the dollar store or candy section of the supermarket! Once you get the hang of making these edible slimes, you can experiment with different candies for different seasons or holidays. 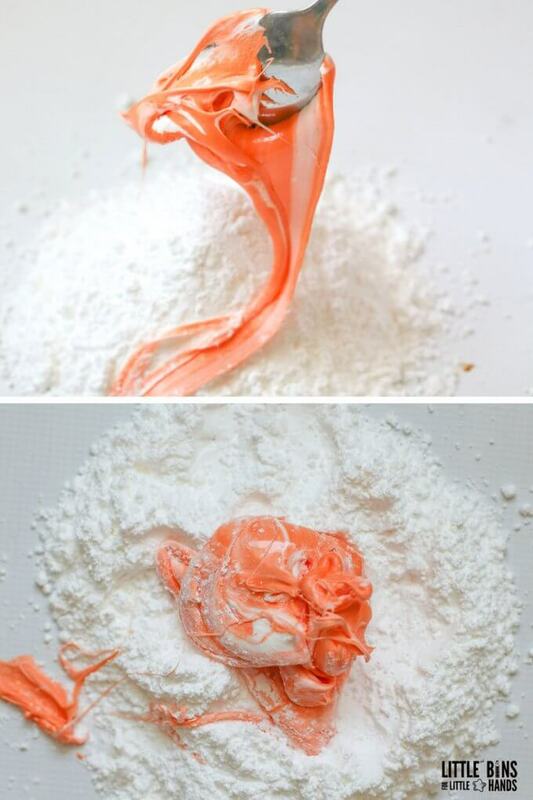 This taffy slime recipe is non-toxic, but it’s certainly full of sugar. 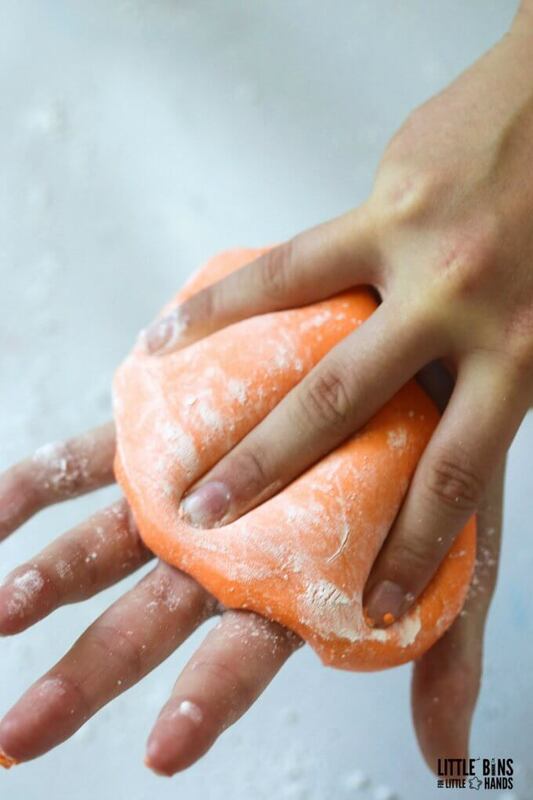 We made this slime without cornstarch, so that it’s even more edible. You can certainly have a taste or two here and there. This is especially important if you have a kid who likes to put everything in his or her mouth! However, I wouldn’t pronounce it snack time and chow down on a bowl full of taffy slime. 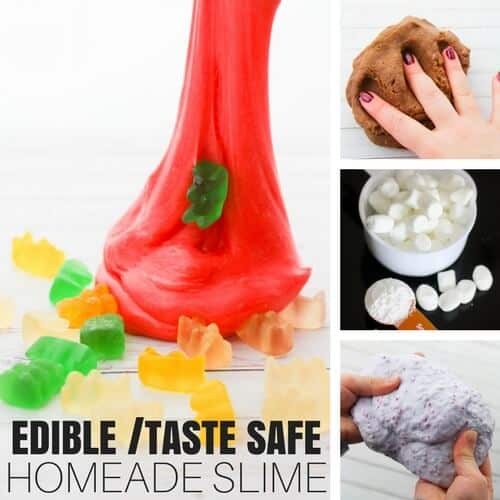 I like to call these kinds of slime recipes taste safe, and I don’t necessarily encourage eating a whole bunch of it. Note: This taffy slime starts off in the microwave. Adult assistance and supervision is recommended when using a microwave and handling hot materials. The taffy mixture will be hot! Add half a bag of unwrapped taffy candy to a microwave safe bowl and microwave for 35 sec to melt. You don’t want to over heat them as they may burn! Remove the bowl carefully from microwave using potholders as needed. Stir carefully to evenly distribute heat and further melt taffy. No lumps or bumps. Add taffy mixture to a pile of powdered sugar on a clean surface. I would recommend starting with a 1/4 cup-1/3 cup to start. You can never take away but you can add more if needed. 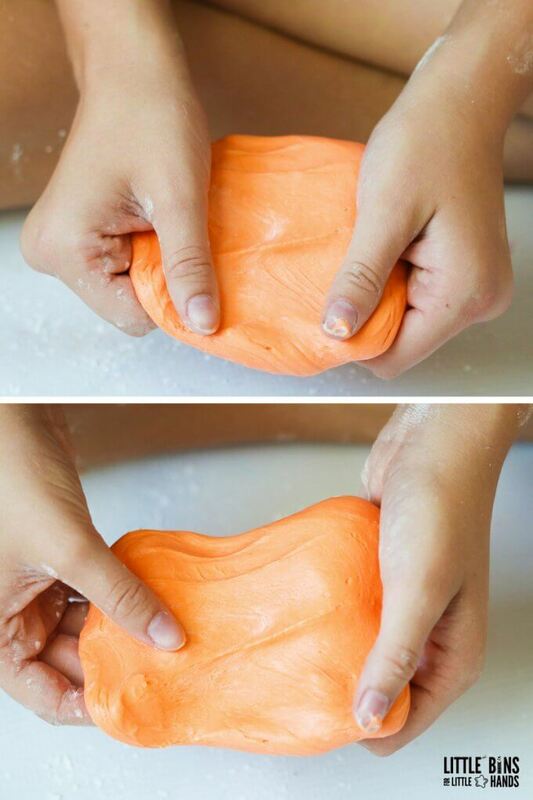 Making awesome edible slime is all about the kneading process. Working the powdered sugar into the melted candy mixture will reduce the stickiness and create a stretchy substance. Mixing up taffy slime with taffy and powdered sugar is going to be a messy experience but a fun one! Just like our regular slime recipes, these new edible slimes are still perfect for squishing and squeezing, but you can also have a little nibble too. Awesome to play with, perfect for taste testing, and still full of stretchy fun that you have come to know and love with homemade slime recipes. 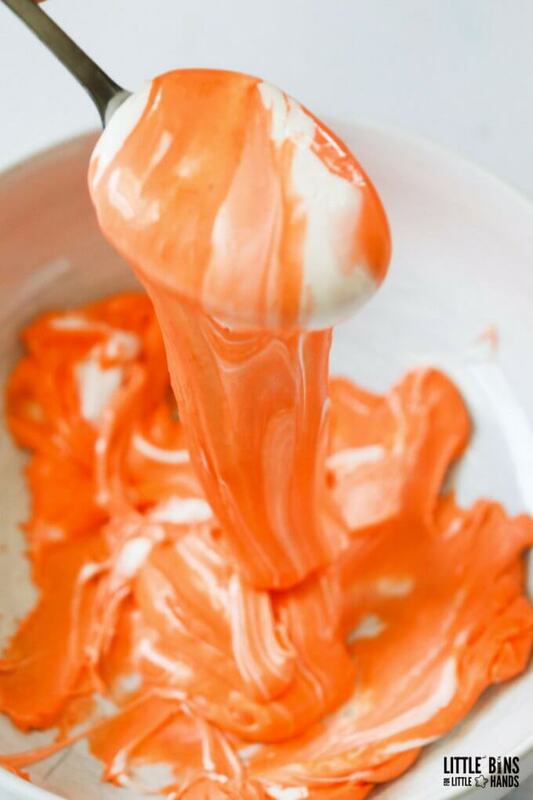 OOEY GOOEY TAFFY SLIME RECIPE FUN! 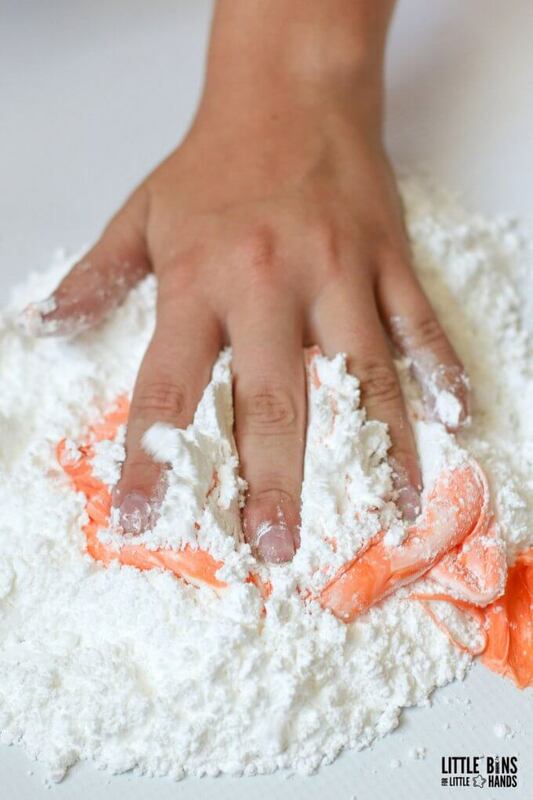 Continue to knead and play with your taffy slime, and incorporate the powdered sugar as needed. You will learn how to make edible taffy slime with all your senses! Squish, squeeze, pull, and stretch your edible candy taffy slime! Once you learn how to make taffy slime, experiment with other flavors or candies. One of the best parts of our edible slime recipes in the sensory experience for the 5 senses! 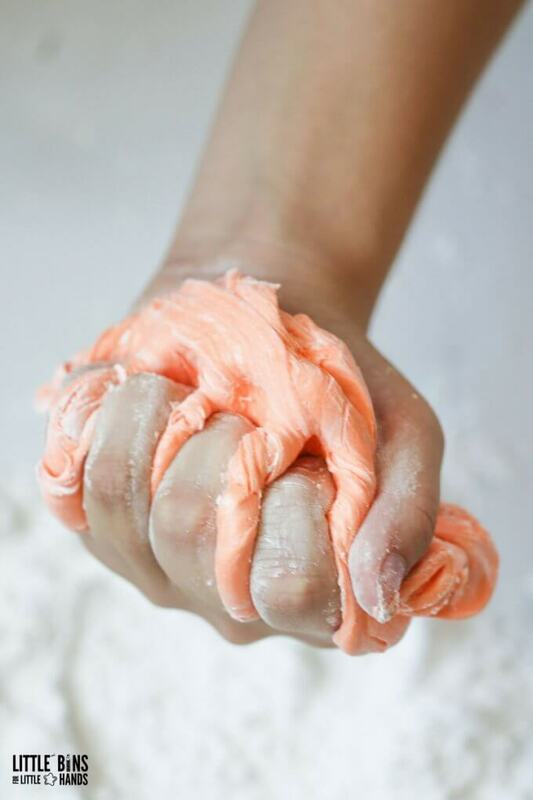 You can easily talk about the 5 senses as they relate to this taffy slime recipe. 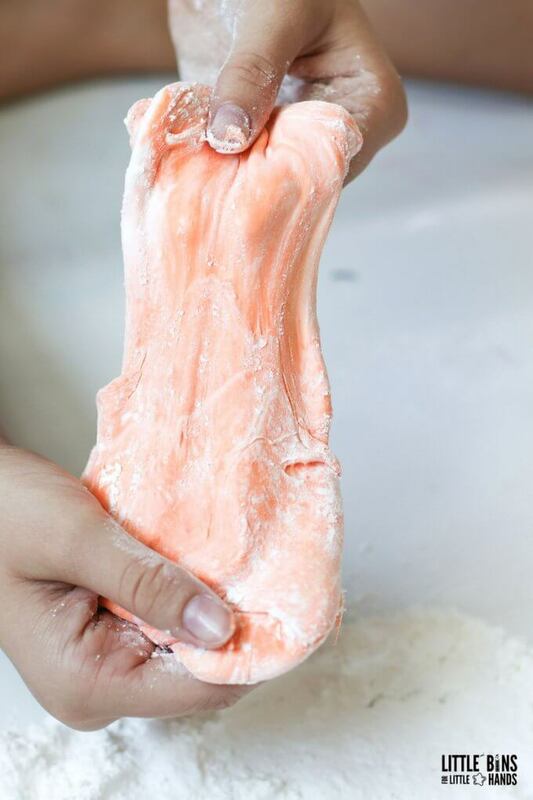 Unlike our regular homemade slime recipes, this edible taffy slime recipe won’t last as long. Make sure to store in a covered container, and it should be good for another round of play the next day. Go ahead and try warming it up in the microwave for 10 seconds before you play with it the next day. Adults make sure mixture is cool enough to play with first! Although edible slime doesn’t last long, it’s still great fun for kids to try out especially if they love new sensory experiences. HOW TO MAKE AN EASY TAFFY SLIME RECIPE!